A trainee teacher, a barrister and a barista are among the 22 recipients of the Arts Council of Northern Ireland’s ACES award, a funding award bestowed upon Northern Ireland’s most talented emerging artists to allow them to develop their profession artistic careers. Awards under the Artists Career Enhancement Scheme (ACES) are made annually to professional artists working in music, visual arts, literature and participatory arts and are among the most prestigious awards bestowed by the Arts Council annually. In addition to receiving a bursary up to £5,000 each, many of the 22 artists have been partnered with a professional organisation to help each of them to deliver a major new creative work. The artists include 8 visual artists, 8 literary artists, 3 artists from drama and dance and 3 musicians. Some of the ACES awardees have partnered with organisations for development opportunities as part of their ACES experience. Those organisations include; Golden Thread Gallery, VOID Gallery, Sonic Arts Research Centre at QUB, NURTUReart (USA), Replay Theatre, PMLD Theatre and Moving On Music. The Artists Career Enhancement Programme (ACES) was launched by the Arts Council in 2010 to provide development opportunities for career artists. Since then, the programme has provided significant financial support to 79 artists at a critical stage in their professional careers, providing them with the means to develop their skills and portfolio of work. • Jiann Hughes. Project title: Inside Out. Jiann is an artist exploring the relationship between human bodies and technology. Jiann’s artworks are mostly interactive or participatory and often use video, sound and computer code. As an artist, she is curious about how we are subtly affected by technological developments and is particularly interested in how the use of biomedical technology is shifting bodily boundaries within our increasingly pervasive surveillance culture. Jiann has been creating playful body responsive installations that use biofeedback technologies to publicly project, using sound and video, the body’s most intimate responses such as heartbeat and breathing patterns. This work developed while she was living in Australia where there is a very strong media arts scene and where she was awarded a practice-based PhD candidature exploring some of her artworks. • John Rainey. Project title: ‘The Baring of Teeth’ Solo Exhibition with Golden Thread Gallery. John Rainey is a sculptor who graduated from the Royal College of Art (MA, 2012) and Manchester Metropolitan University (BA Hons, 2009). In 2013 he completed a residency at Konstfack University College of Arts, Crafts and Design, Stockholm, and was selected to produce an installation for the COLLECT 2013 Project Space, held in the Saatchi Gallery, London. Rainey’s work has also been exhibited at the 2009 British Ceramics Biennale, the National Museum, Wales, and the Onassis Cultural Centre, Athens (current). Rainey’s first solo exhibition, held at Marsden Woo Project Space, London, was supported by the Arts Council of Northern Ireland in 2012/13. Rainey will use the ACES award, working in connection with Golden Thread Gallery, Belfast, to produce his second solo exhibition. The exhibition will feature a new body of sculptural work combining traditional sculptural processes with 3D print technologies. • Ryan Moffett. Project title: Fictional Dioramas. Ryan Moffett is a visual artist (b. Belfast 1987) working mainly with still photography and video. After completing his MFA in the University of Ulster in 2013 he was awarded a residency in the Flax Arts Studios where he is now a full time studio holder. In his practice, he explores the topics of representation, authenticity and fiction. Creating fictional narratives influenced by factual events, he explores the perceived ‘truths’ held within research rich spaces such as documentary practice, museums, national geographic magazines, anthropological texts, and zoological gardens. The ACES award has allowed Ryan the time and funds produce a new series of photographs based on natural history dioramas. Ryan will be going to the Natural History Museum NYC in march to research this topic, and will develop works in the studio based on his findings. The final outcome of the project will be realised in the form of an international exhibition developed in collaboration with CCA Derry/ Londonderry. Throughout the duration of the project Ryan will be working closely CCA's Director; Matt Packer who, along with a selection of other curators, artists and writers, will provide invaluable critical discourse as the work develops. • Helena Hamilton. 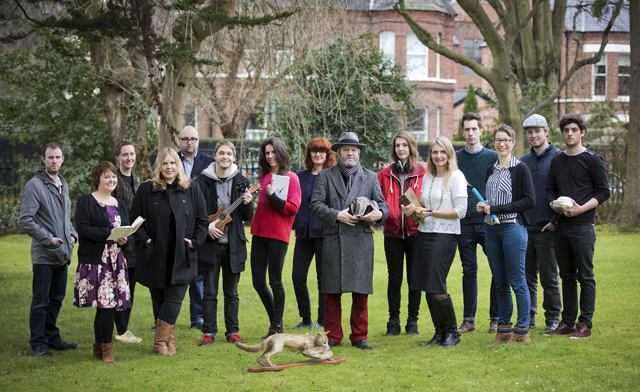 Project: ACES partnership with QUB Sonic Arts Research Centre. Helena is an interdisciplinary artist, working both visually and sonically with a variety of media including sound, live drawing, installation, performance, and interactive digital. Helena holds a BA Honours degree in Fine Art from the University of Ulster (2009) and received MA in Sonic Arts with distinction from Sonic Arts Research Centre, Queen’s University Belfast (2014). programming, visual art and sound. Helena programmes and build software and hardware constructions that create physical and sonic immersive environments via interaction, exploring the physicality of the sonic within and around each device I hacks or adapt. These purpose-built programs exploit low-end frequencies as well as complex sonic textures generated through physical gestures, transforming these everyday objects into electroacoustic artefacts, whilst bringing the audience inside an immersive multi-sensorial environment. This award, in partnership with Sonic Arts Research Centre, will facilitate the unique opportunity of further dialogue, interaction and networking with professional practitioners and theorists, further developing her own practice within this specialised area of sonic arts whilst being mentored by Dr Simon Waters. This support, mentoring and partnership will enable the creation a unique and challenging new body of sound works which Helena aims to exhibit both nationally and internationally. • Kevin Killen. Project title: Captured Moments. Kevin Killen studied from 1996 to 1999 at the Surrey Institute of Art and Design University College (now the University for the Creative Arts UCA), specialising for one year in 3D Design and two years in Fine Art. He continued training in Dallas Texas in 2009, studying neon glass skills; developing his long-term interest in the neon. Now based in Northern Ireland he have been continually exploring his own visual language using the medium of light. Kevin will use the ACES award to continue to investigate unseen boundaries and captured moments, developing these interests through sculpted neon. The Aces award will allow him an unrestricted approach to both his research and practical work. Working with the Golden Thread Gallery to develop his current art practise, the final works will push the neon away from its customary boundaries, working the medium in the three dimensional space. The final outcome(s) would allow the viewer to peer into unseen patterns, captured moments not normally seen. • Ben Crothers. Project title: ACES with NURTUREart; Videorover, Comic Books and the Brooklyn Art Scene. Ben Crothers (b.1987, Belfast) is a Belfast-based curator and writer. He received a BA (Hons) in American Studies and Film Studies from the University of Essex in 2008, through which he studied at the University of Miami, Florida. He also holds an MA in Art History and Film Theory (University of Essex, 2009). Ben has worked at a number of Belfast's leading galleries, including Golden Thread Gallery, the third space gallery, Catalyst Arts and The Naughton Gallery at Queen’s, in addition to developing his own independent curatorial practice. Selected curatorial projects include Psychic Driving, Golden Thread Gallery (2013); Sarah Maple: You can’t just put your work everywhere, a billboard exhibition in Belfast city centre (2013); Juvenilia, The Naughton Gallery at Queen’s (2014); GLUMBA SKZX, Ex Elettrofonica, Rome (2015); and YOUNG ADULT (or, a daring, urgent, malfunctioning age), Millennium Court Arts Centre (2015). For his ACES project, Ben will be working in collaboration with NURTUREart, a non-profit gallery based in Brooklyn, New York. This collaboration will see Ben make a number of trips to New York throughout 2015, including an extended residency at NURTUREart, where he will develop his curatorial research with a particular focus on video art and Brooklyn’s vibrant zine and comic book scene. • Tonya McMullan. Project title: Europa and the Bull. Tonya McMullan is an interdisciplinary artist currently based in Belfast, she was a co director at Catalyst Arts (2010 - 2012), and is a founding member of the PRIME Collective. Tonya’s practise revolves around the exploration of everyday life in the public space through process-based, participatory and performative interactions and interventions within a place. The running themes and concerns often centre on the everyday experience, the exploration of failure and ‘inbetween’ spaces. The work draws on the unique qualities of a space sometimes relying on public interactions to complete the work. The ACES award will be used to fund the production and dissemination of new work originating from an ongoing collection of discarded clothing found on the streets. Using this clothing as material Tonya will create sculptural pieces intended to be used and activated by participants and the public. The award also supports travel to visit the centre for advanced textiles in Glasgow to further research the materials and possibilities for production and to commission an essay which places the work in the wider discussion of contemporary art. The ACES award includes a partnership with the Centre for Contemporary Art in Derry~Londonderry who will offer a career enhancing mentoring programme for one year. • Helen Sharp. Project title: 'Contemporary Feral' Curatorial Project with VOID Gallery Derry. Contemporary Feral is an ambitious curatorial project investigating ideas of ‘wilderness, wildness and the untamed state' in its widest context. The project will be made in partnership with VOID gallery in Derry/Londonderry, The British Council Collection and leading experts in natural history. The project will lead to an exhibition featuring international and national artists, writers and architects and it is my hope to build an art outpost in a remote location as part of the process. The project is aimed at developing Helen’s skills as a curator, artist and thinker, to enable her to produce a major new curatorial project for Northern Ireland and possibly beyond. Helen is trained in fine art up to PhD level (with First class honours in Sculpture and a Masters with distinction in Time Based Art) and has been exhibiting, managing and curating work since 1996 internationally and within Northern Ireland. She recently worked as Production Designer on David Holmes’s directorial debut I Am Here, nominated for best experimental short film at the London Short Film Festival and she is co-founder of Outland Arts. In 2014 Helen was invited to make work for Kent University's Tone Festival of Sound and Light. Her work is held in a number of private collections and she has been working as visiting artist at The Model, Sligo and in collaboration with sculptor Simon Carman. Helen has been invited to take part in The SALT art festival in Norway in 2015 as part of her on-going art practice and curatorial research into contemporary art in wild and rural locations. • Elaine Gaston. Project title: The Back Road. Elaine Gaston is from the north Antrim coast. She was awarded the No Alibis Prize at the Seamus Heaney Centre for Poetry, Queen’s University, Belfast, where she completed an M.A., with Distinction, in 2010. She won a Commendation in the National Poetry Competition, 2013, a Special Commendation in the Patrick Kavanagh Award in both 2013 and 2014 and was short-listed for the Bridport Prize 2014. She has also won prizes in the Templar Poetry Pamphlet Competition and the Academi Cardiff International Poetry Competition. Her work has appeared in poetry journals and in Study Ireland, Poetry, BBC 2 Northern Ireland. Her poem 'Push-Bike' was also commissioned as a filmpoem by the Poetry Society and premiered at the Antwerp Filmpoem Festival 2014 and in the UK at the Poetry International Festival at the Southbank, London, 2014. Her work has been translated into Russian and Spanish and was selected for Poetry Ireland, Introductions, 2006. During the period of the award she will complete and launch her first poetry collection which is forthcoming with Doire Press in 2015. She will also run workshops and poetry surgeries - where writers have one-to-one feedback sessions - in arts and other venues. • Erin Halliday. Project title: The research and writing of a first draft of a second full collection of poetry. Erin Halliday was born in Belfast in 1982 and was educated in Classical Studies and English. After a brief career in horticulture, working in National Trust gardens both in Northern Ireland and in England, she returned to university to gain a PhD in Creative Writing. She wrote her thesis on theories of translation, applying these to Classical Latin poetry and modern rewritings of such, as well as producing a portfolio of poetry including her own ‘versions’ of episodes from Virgil’s Georgics and Ovid’s Metamorphoses. Erin’s poetry has appeared in Cyphers, Fortnight, FourXFour, Poetry and Audience, Poetry Proper, The SHOp, The Stinging Fly, and The Yellow Nib. Her pamphlet ‘Chrysalis’ won the 2012 Templar Poetry Pamphlet & Collection Awards. In 2013 she received a Support for the Individual Artist Award from the Arts Council of Northern Ireland to fund the completion of her first full collection of poetry, which is forthcoming from Templar in 2015. The ACES Award will fund the writing of her second collection, in which she aims to further explore the place of Classical translation in modern poetry, undertaking a translation of Book VI of Homer’s Odyssey, and considering how ekphrastic poetry might reconcile the Classical with the modern. • Stephanie Conn. Project title: Development of a Second Poetry Collection. Stephanie Conn is a poet and primary school teacher, originally from Newtownards, and now living in Ballyclare with her husband and two daughters. She developed the literacy programme, Passport to Poetry, facilitating poetry workshops for 7-11 year olds. In 2013, Stephanie graduated with a Master’s Degree in Creative Writing from the Seamus Heaney Centre at Queen’s University Belfast and her poetry has been widely published. Her work has been shortlisted and highly commended in a range of poetry competitions including the Patrick Kavanagh Prize and the Mslexia Pamphlet Competition. She was selected for Poetry Ireland’s Introductions Series and was a featured poet at the New Writers’ Salon at the Listowel Writers’ Festival. Doire Press is considering her debut collection for publication in autumn 2015. Stephanie’s ACES project will see her begin work on a second poetry collection, which will take her family connections with the Copeland Islands, off Donaghadee, as its starting point. This will involve historical research into the lives of her great-grandparents, who spent their whole lives on the Big Island. • Michael Nolan. Project title: This Is A.
Michael Nolan graduated from the Creative Writing MA at the Seamus Heaney Centre in 2012. His short stories have appeared in various publications including The Stinging Fly. His novella, The Blame, was published by Salt as part of their Modern Dreams series and was launched at Belfast Book Festival in June 2014. He co-hosts the Linen Hall Writers’ Forum reading series with Padraig Regan, is currently working on a collection of short stories and a novel titled, Aoife. His stories are predominantly set in contemporary Belfast. The Blame, for instance, follows Donal, a young man trying to make sense of his friend, Pearse, dying at the hands of the fatal Green Rolex Ecstasy pills that have surfaced around the city. Bottles, published in The Stinging Fly, is told from the point of view of a narrator who is tormented with a sudden and unsuspecting obsession with pregnancy tests. Aoife, is a story about a young woman whose husband has been in a long-term coma for the past three years, and centres around her struggle to break free from the inertia she has fallen into. Bronagh McAtasney tweets her recently rediscovered 1981 diary on a daily basis at @NrnIrnGirl1981. The diary covers everything from boys, the Top 20 and school to the hunger strikes of that year and how The Troubles impacted on the life of a 14 year old from Newry. The diary has a huge following on Twitter and has been used in Belgium as an educational aid to Northern Irish literature. Bronagh will use her ACES award to develop the diary in a number of ways, including using digital technology to turn it into an interactive, engaging, fluid text, moving from word to image to sound smoothly and with educational, social, historical and, most importantly, artistic impact. • Caroline Healy. Project title: Just Say Yes -First draft of contemporary young adult novel and C.P.D. at Bologna Children's Book Fair. Caroline Healy is a writer, community arts facilitator and creative writing tutor. She recently completed her Masters at Queen’s University, Belfast at the Seamus Heaney Centre. She published her first award winning collection of short stories, entitled A Stitch in Time in August 2012. Her work has been featured in publications such as Wordlegs, The Bohemyth, Prole and the Irish Writers’ Centre Lonely Voice, as well as on Short Story Ireland, Five Stop Story and Short Story U.K.
She writes literary fiction and young adult fiction, with her Y.A. book Blood Entwines was published by Bloomsbury in 2014. Reading at the Brooklyn Book Festival as well as literary partnerships with global organisation Narrative 4 helped showcase her work across the Atlantic. Her second short story collection House of Water is to be released later in 2015. For the present, she is working on a new project, Just Say Yes, a Y.A. contemporary novel which has been funded by the Arts Council of Northern Ireland Artist Career Enhancement Scheme Grant. Rebecca Reid was withdrawn from school due to illness at fourteen. Being limited in the things she was able to do, she wrote all the time − poetry, stories, feelings, thoughts. At 16 she had her own page in the local weekly newspaper, the Bangor Spectator. At 17 she became a model but writing was still her passion and in 2008 she graduated in English from Queens University, Belfast. She lives in N. Ireland with her three daughters. Her debut psychological thriller, ‘The Coop’ was self-published to great success in 2012, reviewed by Sue Leonard of The Irish Examiner as ‘A beautifully written debut.’ ‘Thickets Wood’, published in 2014, is her debut print novel, described as ‘remarkable’ by The Sunday Times. She is currently in negotiations with a new publisher regarding a future publication and is working on a fresh manuscript as part of her Arts Council ACES project. Her aim this year is to harness social media and get to know her readership through involvement in literary festivals and youth educational projects. Steve Cavanagh is a civil rights lawyer from Belfast. He’d always wanted to write a novel but it wasn’t until his mother passed away suddenly in 2011 that Steve finally decided to try writing a book – one that his mother would’ve enjoyed. Steve started writing about a former con artist, turned New York trial attorney, Eddie Flynn. Little did Steve know that two years later he’d be represented by the same literary agency that represents Hilary Mantel (AM Heath) and four major UK publishers would be bidding on the rights to publish that book. Steve sold the UK and commonwealth rights to The Defence to Orion Books, and is working with the same editorial team behind such writers as Ian Rankin, Harlen Coben and Michael Connelly. Translation rights for The Defence were bought by Blanvalet (Penguin Random House, Germany) in a six figure auction and further translation rights have sold in Holland, Italy, France and Japan. Steve has already been named by Amazon as one of the best debut authors of 2015 as part of their Amazon Rising Stars programme. 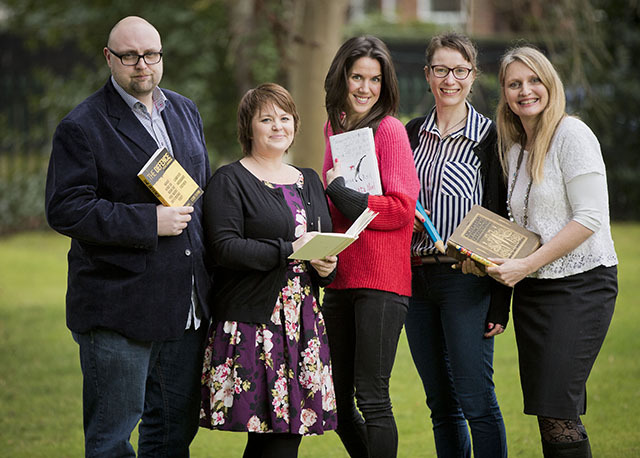 Working with the Seamus Heaney Centre, Steve will complete a novella featuring Eddie Flynn and will use his award for researching and helping to build a readership in Northern Ireland. The Defence is launched in the UK and Ireland with a special event at No Alibis Bookstore on 12th March 2015 at 6.30pm. • Cat Barter. Project title: Interactive Multi-Sensory Adventures for PMLD Theatre. Cat Barter developed a passion for making theatre designed for children with Special Educational Needs after working with Replay Theatre Company on their production of BLISS. On this tour Cat discovered that the children had the ability to engage with me rhythmically and musically, which was something she had wrongly assumed was beyond their capabilities. Under the mentorship of Replay Theatre Company, and with the assistance of Oily Cart and Drake Music, Cat will train in accessible music-making techniques. Alongside this training, she will be researching cutting-edge Assistive Music Technology (AMT) with SkoogMusic, and discussing the ethical questions that this project raises with David Goodall, a university lecturer in the subject. The project will culminate in a creative development session with associate artists, including Max Reinhardt and Clare Galway. Using her discoveries, they will devise interactive experiences to take into Glenveagh Special School. Together they will explore characters and narratives that are directly inspired by their responses. The recordings of these sessions will be uploaded into the chosen AMT and given to the class to control. Through interactive play they will make decisions that affect how a story and characters can unfold. The viability of programming a future theatrical adventure for SEN children based on this research will then be discussed with Replay. • Dan Leith. Project title: ACES partnership with Replay Theatre Company. Dan has been working as an actor and writer based in Belfast for a number of years. When he was studying at Queen’s University Belfast he met the wonderful Anna Newell who he worked with further in the Lyric Drama Studio. One day he played her a song. It was a song that he had written about his dog and she told me him that he should write a show about that. Some years later Anna became the artistic director of Replay Theatre Company and approached Dan about devising a show called ‘A Boy And His Box’ with an artist called Patrick Sanders. Dan wrote the music for this show using a ukulele, a keyboard, and whatever other instruments he could find. ‘A Boy And His Box’ was a success and toured extensively through venues and primary schools in Northern Ireland and England last year. After it was all over, Anna suggested that Dan apply for an ACES grant so that he could write another show with Replay Theatre Company. Dan was over the moon when my application got accepted and now I am beginning work on a new show which will feature music (especially ukuleles), film and video work, and very probably his dog. • Stephen Beggs. Project title: Father Figures. Stephen has been working as a Creative Producer, Actor, Director, Writer and Theatre Maker for almost 20 years. As well as producing over 20 high quality productions for Bruiser Theatre Company, he has also created acclaimed work with Young At Art, Those Who Can’t comedy group, Sticky Fingers, Premiere Circus, The MAC, The Beat Carnival, Pigeon & Plum Music Hall, and has extensive facilitating and directing experience with arts and community groups. Stephen’s ACES project is called ‘Father Figures’ and will explore the theme of fatherhood and what that means to different people of all ages. The aim of the project is to lay the foundations for a future theatre production for young audiences. The project will be an exploration of his own craft as a theatre maker and development as a solo creator. This will take place through creative workshop and interview sessions across Northern Ireland; mentored development work in Belfast and Switzerland; and travel to two international arts festivals to broaden his experience of artistic working practice. • Ruth McGinley. Project title: Recording Project/Moving on Music Partnership. Ruth McGinley is a pianist from Derry. She gained recognition as a classical pianist at a young age when she won the piano final of the BBC Young Musician of the Year competition in 1994. She performed extensively throughout UK, Europe and the Middle East and as soloist with the BBC Philharmonic, London Mozart Players, RTÉ Concert Orchestra and Ulster Orchestra. She went on to study at the Royal Academy of Music and the Royal College of Music in London. Returning to Northern Ireland 10 years ago, Ruth has combined her musical career with motherhood. She has a busy career as a chamber musician and teacher and is the accompanist for the multi-platinum selling trio The Priests for the past 5 years. In 2013, her hometown of Derry became City of Culture. Ruth found herself back in the seat of soloist once again in broadcasts for BBC Radio Ulster and performances with Ulster Orchestra. Ruth is delighted to have received an Arts Council ACES Award. It will enable her to record and launch her debut solo album; a contemporary classical album reflecting her musical life. She hopes to promote it in an engaging and innovative way to reach a wide audience. • Kim Vaughan. Project title: Development of Quercus Ensemble and individual performance / Moving On music Partnership. “The ACES scheme offers me a great opportunity to develop my cello playing and to further enrich my musicianship and interpretative skills, through preparing some of the great masterpieces of the cello and piano repertoire. Inspired largely by the German Romantics, the programme I have chosen reflects my own musical passions and, I believe, will be enjoyed by audiences across Northern Ireland. I am very much looking forward to working closely with my pianist on this great music and to presenting it to different audiences throughout our tour. The ACES scheme also allows me to work closely in partnership with Moving On Music, who will not only help to facilitate the concert tour but will also, in its Mentorship capacity, offer guidance as to my role as Artistic Director of Quercus Ensemble. Through the mentorship I have time to develop future projects for the Ensemble, central to which are building new audiences and furthering our work with young musicians across Northern Ireland." • Jason O’Rouke. Project title: The Northern Concertina. Jason O’Rourke is a Belfast-based musician. He has been playing traditional Irish music on the concertina for almost 30 years, and has made a number of recordings. A regular at the vibrant Belfast traditional music sessions, he has also toured extensively in Europe and the USA. Being self-taught, Jason has his own style of playing, which has two major influences: traditional dance and the percussive Belfast flute style. Jason’s playing accordingly has a distinctive rhythmic quality. His ACES project, The Northern Concertina, will promote and develop the ‘Northern’ style of concertina playing. Despite Belfast’s strong tradition of rhythmic musicianship, this regional style is under-represented on the concertina. The project will involve the recording of a new CD, which will feature new compositions by Jason alongside existing traditional tunes. There will also be live performances, workshops, and talks, staged in partnership with An Droichead, the Irish-language arts and cultural centre on the Ormeau Road. The project will involve the local community through talks and performances. The Northern Concertina will build public awareness of Belfast concertina music. It is hoped that the project will leave an enduring musical legacy and identity that can be passed on to future generations.